DUFF’S BOTTOM, Tortola, VI – After delayed start, which did little to amuse Bishop John I. Cline, the annual Xperience Outreach basketball camp, concluded on Friday July 10, 2015, with two exhibition games and a Slam Dunk display, at the Save the Seed Energy Centre in Duff's Bottom. As the crowd began to grow and the players warmed up for the first game, Bayside Blazers against Virgin Gorda Select, the founder of the Save the Seed Energy Centre Bishop John I. Cline had to apologise for the delay. “I apologize for the delay, but the Officials are on their way. For me I don’t respect people who don’t respect other peoples time, but nonetheless we will move on,” he said. 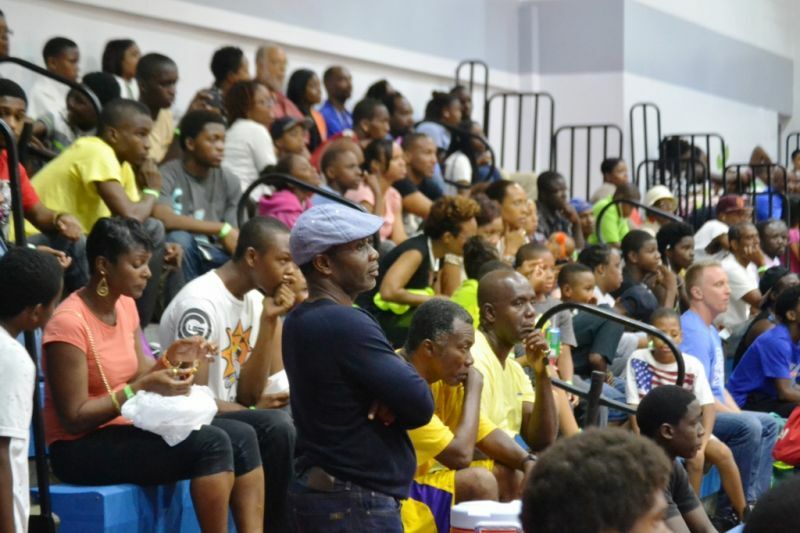 Luckily the referees then arrived and once the Honourable Myron V. Walwyn had congratulated the Bishop on his initiative, things got underway. “It’s not just about the game, but about preparing young people for life. 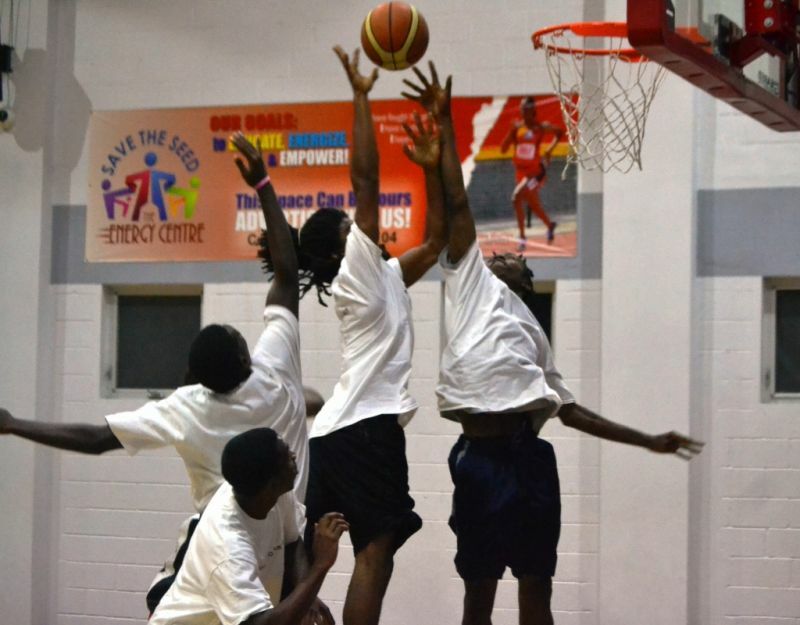 Basketball is a game, but also teaches respect and we want to thank those persons who have given their time to work alongside others, including those from oversees, to transfer their skills to our young people,” said the Minister. 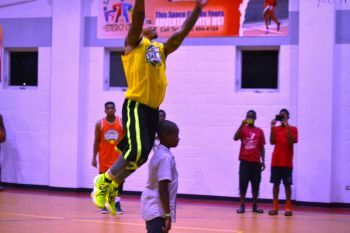 The Youngsters from Virgin Gorda certainly seemed willing to show their skills as they raced into a 10 point half time lead against the Blazers, who were the Hon Julian Fraser Save the Seed Basketball League 2014 Champions, 31-21. However with a much deeper bench than their opponents from the sister island, the Bayside Blazers began to pull themselves together collectively and reduced that deficit and were level at 50-50, with just over four minutes to go in the game. 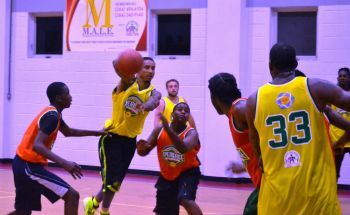 The Bayside Blazers then went up by 3 with 3:41 left on the clock and despite some last minute frantic action held onto to win 64-61. Jevon K. Serrant top scored for the Blazers with 13 points, Ryan R. Alfred notched 10, Mikey S. Joseph 9 and both Sandal E. Nadal and Glenal A. Layne, 8. For VG, Kimani Stevens scored 19 points, Stephon Caul 8 and Aldric Thomas also 8. 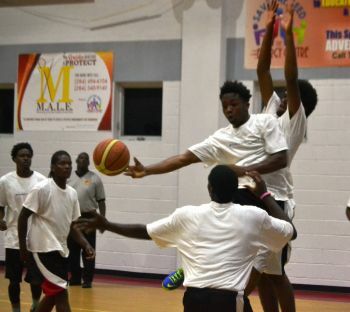 The second game of the night featured the American coaches, who had been presenting at the Camp and a Tortola XI. 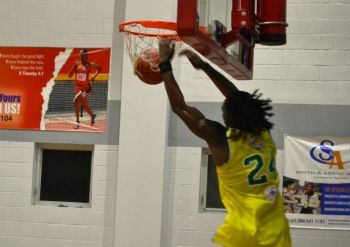 They scored a 20 point blow out, 124-104, despite the efforts of the younger Tortola players who were definitely out to impress. D’Moi Hodge led Tortola with 13 points, Neville Smith Junior notched 12 and Jason Edwin 11. Mike James scored 31 for the Coaches, Brandon Matano 26, Calvin Warner 21 and Jah Howard 20. The Slam Dunk contest, perhaps the highlight of the evening, became more of an exhibition as Matano was head and shoulders above anyone else and thrilled the crowd with a through the legs, reverse 360 spinning effort and then by leaping over Isaiah Thomas and producing another thrilling dunk. how come I did not know about deeds games eh? Why can't you say something good about your own the older guys didn't really keep up yes but look at how nicely the younger kids played show support for your own they played pros and did quite well!!!! 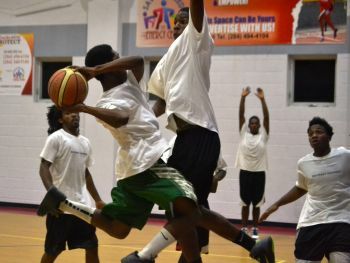 The NBA just had a camp today on the island and it was good but the Camps at the Seed with those U.S. Coaches are better and more hands on with the youth.